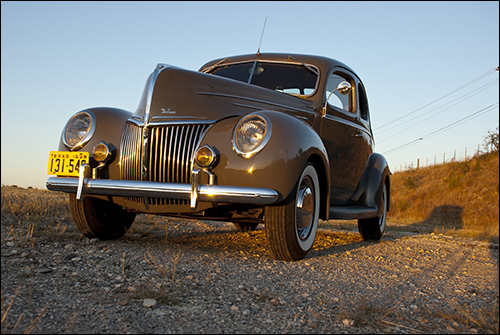 I’ve owned “Henry”, my 1939 Ford Deluxe Coupe, for some three years now, and have enjoyed every minute of it. 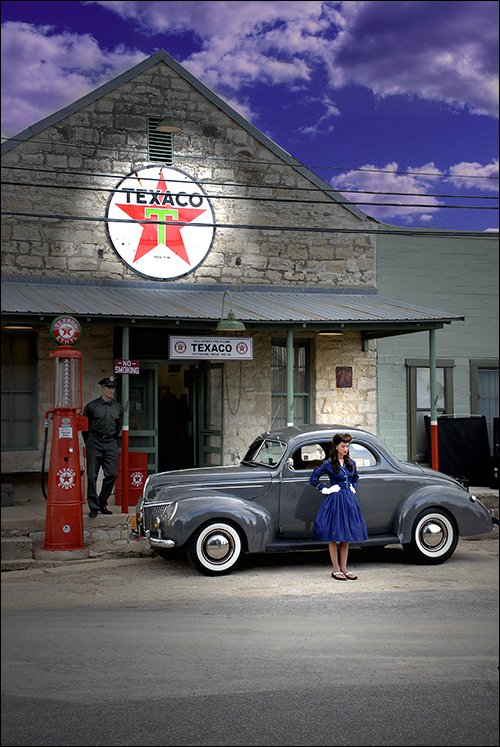 I first got the hankering to own a Ford Coupe after my buddy Doug convinced me to attend the Longhorn Hotrod show. “Hot rods” per se have never been my cuppa tea, but Doug owns a beautiful ’32 Ford 3 window coupe that is to die for, so I went along. I had never paid much attention to the 39-40 coupe style, but there were several on display at the show, and I instantly fell in love with that iconic shape (the 39 and 40 bodies are pretty much identical, but distinguishable by significantly different interior and exterior trim). 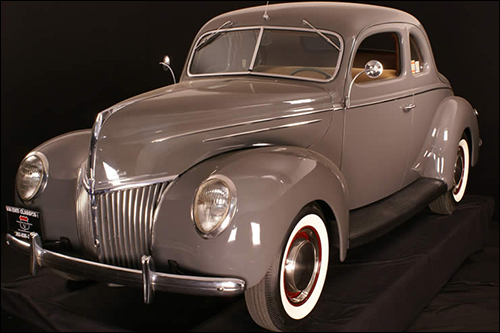 Although some favor the ’40 coupe, I knew right away that the ’39 was the model for me. I liked the vintage look of the floor mounted gear shift (40’s had 3-on-the-tree). 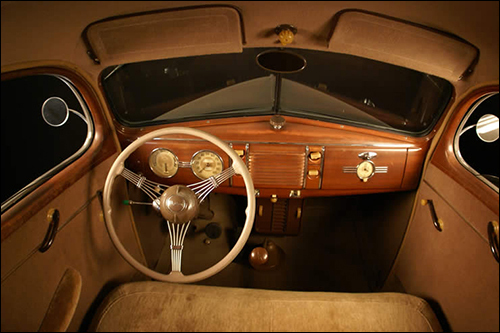 Additionally, the ’39 dash has to be one of the most beautiful ever designed… simple elegance… a beautiful faux wood metal finish is applied both to the dash and all metal trim in the car (Ford used a very special rolling wood grain pattern to prepare these). 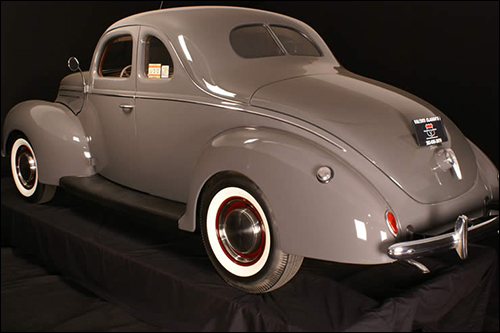 Inexplicably the “improved” ’40 coupe came with an unattractive-to-me maroon painted dash and trim. Additionally, I loved the banjo-style steering wheel on the ’39 coupe (Deluxe model only), with integrated headlight switch right in the center of the wheel (Lexus, eat your heart out!). 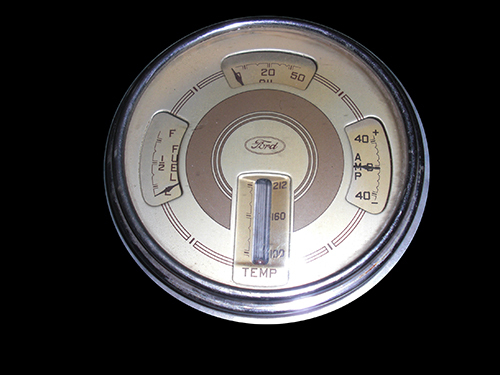 Again, the ’40’s had a cheap-looking 2-arm steering wheel with headlight switches moved to the dash. Finally, I really like the “crank-out” windshield which can be opened slightly at the bottom (it’s hinged at the top), for additional ventilation (great for Texas summers). 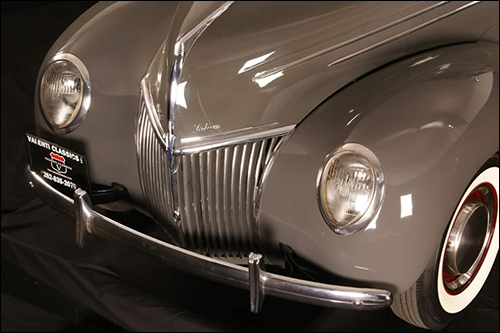 Even the exterior trim on the ’39 I find more streamlined and attractive. 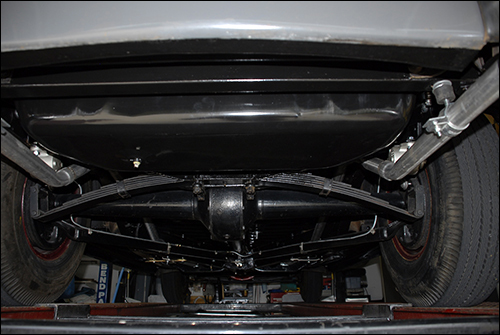 Finding a physically unaltered Ford Coupe can be an exercise in frustration, and such was the case with my search. I scoured the internet for months, only to learn that most of these beautiful machines had been hacked into custom “hot rods”, whereby some genius tossed that beautiful flathead motor and stuffed in the ubiquitous Chevy small block; removed the most beautiful steering wheel ever designed and slapped on a tilt steering wheel from a 1980 Impala, then upholstered it in some garish Naugahyde, with a metalflake exterior paint job. Or, the car had been sitting in the back of Farmer Jones’ field for the past 40 years and all but consumed by the tin-worm. 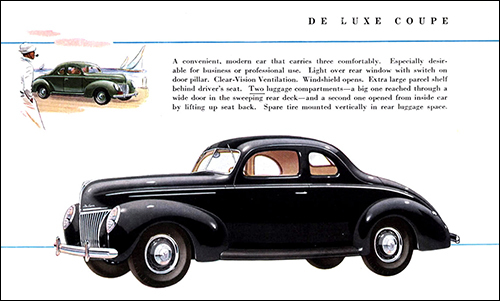 I wanted a Deluxe Coupe that looked like it actually came from 1939, otherwise I would have just gone out and bought a Lexus and be done with it! Finally, after a long a fruitless search, “Henry” appeared at a specialty classic car dealership in Wisconsin. 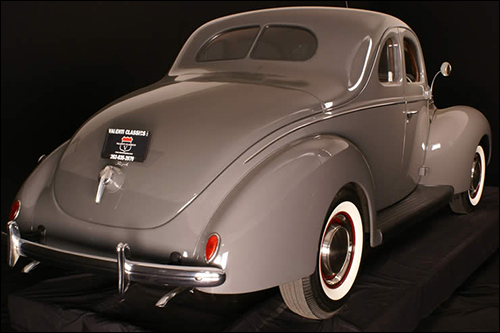 I hopped on a plane, inspected the car, and made a deal on the spot, paying top dollar for what I still believe to be one of the best ’39 coupes in the country. 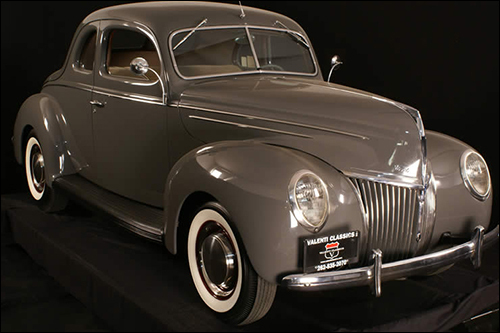 Finished in the perfect original color of Dove Grey, Henry would have represented the pinnacle of Ford motoring in 1939. 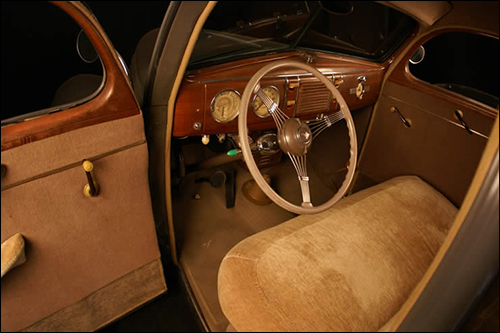 The “Deluxe” model, as mentioned, included much more brightwork that the “Standard”, both interior and exterior, the banjo steering wheel, and wood grain metal finishes (all just plain grey paint on the Standard). 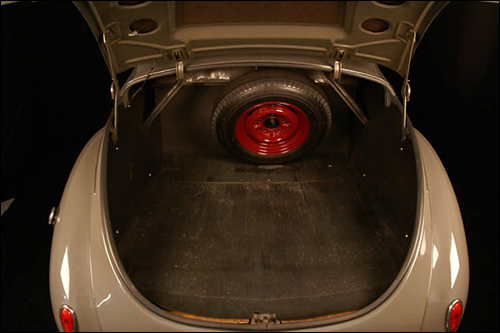 The interior has all been impeccably restored with period-correct mohair seat covers and door panels, and new headliner. Of course all the rubber moldings around doors, windows, etc are in like new condition. 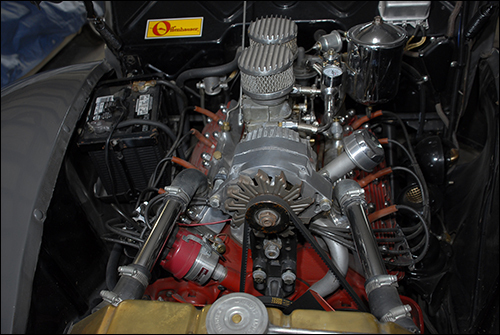 I was pleased to learn that Henry had been outfitted with a physically-identical but later model and larger flathead V8 (255 cubic inch, vs the original 239 C.I.). 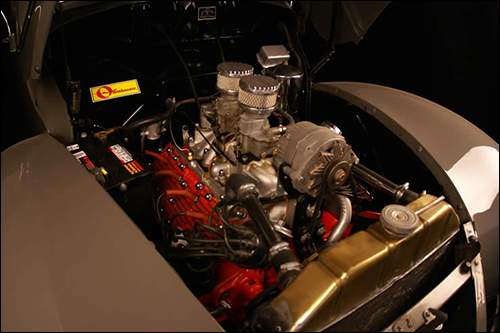 A number of period-correct upgrades had been added, including a dual Holley Offenhauser manifold, Fenton finned aluminum heads, and dual exhaust headers. Additionally, the car’s original 6V generator had been converted to a 6V alternator. As well turn signals and High Intensity headlight bulbs had been added. There is nothing I hate more than to see a “restorer” cheap-out and slap some funky under dash engine gauges from Autozone, rather than just making the original units work! 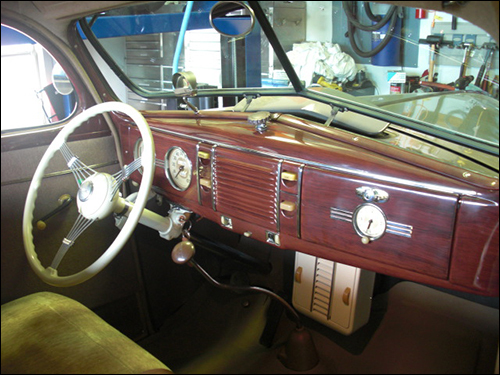 Once I received the car, I was not satisfied with the original condition of the wood grain metal work in the car.. this was about the only thing that had not been restored by the previous owner, and I wanted it to look perfect. I removed every single interior metal trim piece (including the dash) and sent them off to a West Coast concours refinisher. They came back absolutely beautiful, most certainly better than originally from the factory! The wheels are beautifully finished in a complimentary maroon color, and set off with perfect, period-style hub caps and beauty rings. The white wall tires all have tread like new, with the rear tires being slightly larger as was the custom in those days. The best part of this car, of course, has to be driving it! Scoot yourself behind the ample steering wheel, and appreciate the incredible amount of headroom in this car. 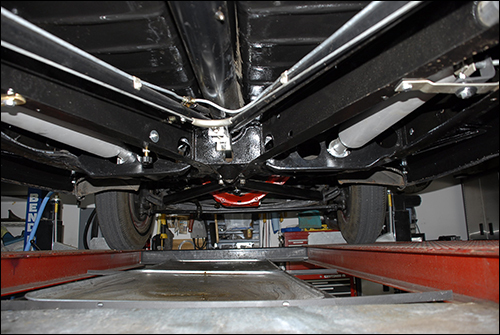 Looking down that long hood gives the driver a feeling of invincibility! Turn the combination ignition key/steering lock (imagine.. a steering wheel lock in 1939! ), open the choke just slightly, and without needing to touch the gas pedal, hit the starter button. The engine immediately springs to life, just purring quietly. There is nothing quite like the sound of a Ford flathead engine, especially with dual exhausts, and that trademark po-ta-to, po-ta-to, po-ta-to idle. You would swear the engine is turning over at about 200 RPMs but it is very happy just gurgling away. Depress the clutch, engage the smooth-as-silk gear shift into first gear, and off you go. 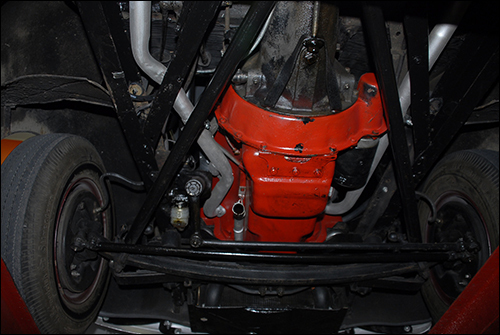 At first, a new driver might be concerned about having only 3 forward gears in the transmission. Once underway, however, all those concerns disappear. These old flathead engines have loads of torque, and could easily be driven around all day long from a standstill to highway cruise in high gear alone. As with most cars of this vintage, first gear is NOT a synchromesh gear, meaning you absolutely must come to a complete stop before engaging it. This is never a problem, as the driver soon learns that second gear is quite capable of accelerating briskly from even the most minimum forward momentum! Engage high gear and enjoy the acceleration of this mildly “enhanced” engine. 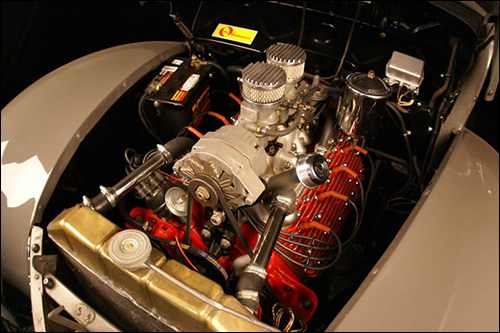 For serious acceleration, press that pedal to the floor, at which point the adjustable sequential carburetor linkage brings that second Holley 94 carb to life and you get to experience that extra kick in the pants! This car will cruise all day long at 70-80 mph and never even breath hard! Stopping is equally effective. 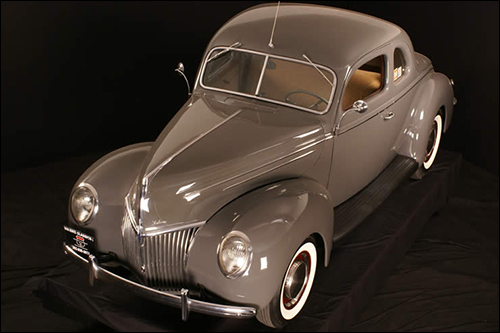 The brakes on these coupes are enormous (1939 was the first year that Ford switched from old-style mechanical brakes to hydraulic “juice” brakes, and Henry wanted to get it right! For a 40’s era car, gas mileage is surprisingly high, at around 18 mpg for highway driving (most all of my other pre-’70 vehicles get, at best, 10 mpg). It’s not a sports car by any means… with such a relatively narrow track, and high center of gravity, the driver won’t be tempted to set any new lap records. What he does get is a commanding view of the road, and the unforgettable experience of driving a superb 70 year old vehicle!